Let’s get one thing out of the way. Being a competitive Netrunner player is hard. If you want to be really good at this game you need to spend a lot of time, energy and probably money dedicated to what is essentially a children’s card game. You’ll inevitably face disappointment, frustration and the confusion of your friends and family along the way. So, this series of articles might not be for you. There are a bunch of people out there who only like playing for fun around a kitchen table. Maybe you only enjoy Netrunner if you’re cube drafting, or you want to save money and play from a limited card pool. It’s even possible that going to a tournament, and the step-up in pressure and competitiveness that you’ll naturally run in to as a result of that, really puts you off and you’d rather just play casually. If that’s you, then that’s great. Please enjoy Netrunner in whatever fashion suits you, and don’t ever let anyone tell you that you’re playing the wrong way. 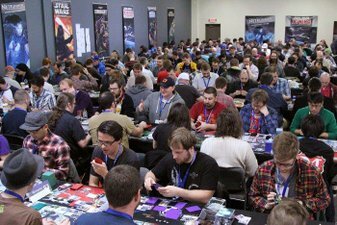 Personally though, my favourite part of playing card games has always been going to tournaments. I love the buzz of being in a room full of people who all share your hobby. I enjoy sitting down with people I’ve never met and never normally would, and spending an hour playing a game with them. I like testing myself against the best players and the best decks. I even grudgingly welcome the headache that inevitably comes after ten hours or Netrunner. So if you’re wavering at all, I’d recommend you take the plunge and try a local tournament. Before you know it you’ll be planning your calendar around the regionals schedule and wondering if you can convince yourself that Minnesota in November is really a valid holiday destination. Here’s the dirty secret, though. Tournaments are more fun when you’re winning. In fairness, this might not be the case for you. It’s possible that you go to tournaments just to hang out with your friends, or because you want to get your deck’s crazy combo to go off in a competitive environment so that you can see the look on your opponent’s face. Once again, that’s fine. But most people go to a tournament with a hope or a dream of doing well. You want to win games, you want to hang around at the top tables, you want to make the cut and take home some sweet prizes. At the end of the day, you want to look around at everyone else and think “Yep, I beat them.” And that’s fine too. Wanting to win is completely natural. That’s where being a competitive player comes in. Your definition may vary, but to me a competitive player is someone who enters a tournament with the primary goal of winning, rather than just having fun. So, how do you become a better ‘competitive player’? That’s one of the most commonly asked questions in Netrunner, but it’s also one of the hardest to answer (right behind ‘how do you spell Scheherazade’). In this series or articles we’ll try to answer that question. Each week, we’ll dig in to a different element of what makes someone a good Netrunner player. Depending on where you currently are as a player you may know some of it already or it may be brand new to you, but hopefully players of all skill levels will find useful. We’ve got a team of top level tournament players from the UK and abroad lined up to share their thoughts, insights and tips, so if there’s anything that you particularly want to read about then let us know in the comments. Our first article will talk about taking the first step from being a casual player to a competitive player. Look out for it next week! Chris Dyer has been playing Netrunner since the core set, and is a staple at tournaments around the UK. He still doesn’t know how to spell Scheherezade.